Last month, Jeremy Tanavit aka JEM as the cool kids call him, “JEM” character was sunken down into a miniature size and snapped up in quick succession. After last months debut Jeremy proves size doesn’t matter and its what you do with it that counts, HA! Meet Strawberry edition JEM (JAM). JEM is blending of what Tanavit23 likes personally, dashes of Ron English, hints of Singapore’s Merlion and that bad all ROCK pose and now Strawberry edition JEM (JAM) is believed to be not too sweet not too sour (we don’t recommend eating Strawberry edition JEM). 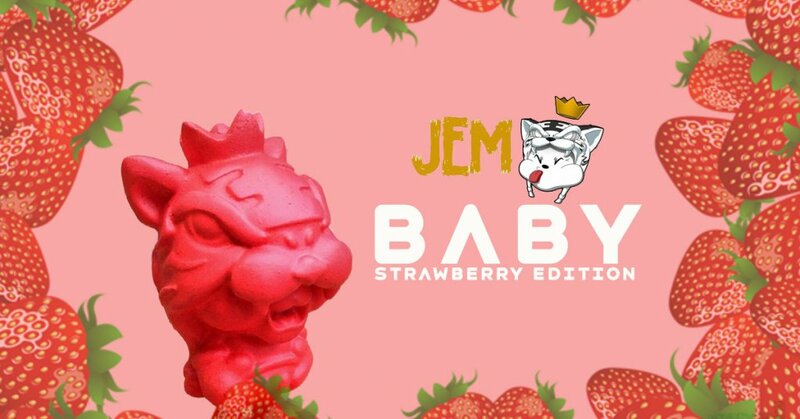 Only a few more hours before Jeremy releases the Baby Strawberry JEM’s! You can find Tanavit23 via his Instagram and Twitter.